Champagne bubbles are magical. And if the bubbles are in a glass of wonderful and unique Moët & Chandon, even better. Send them this unique basket and enjoy those shared moments bursting with happiness. Bottle of Moët & Chandon. Let the feelings flow between the person you’re surprising with this gift and you. Together with the champagne, a perfectly-designed box of Lindor chocolates, 150g of pleasure best tasted in bite-size pieces. And to add the finishing touch to this marvellous gift, a couple of teddy bears, so smooth and soft that they’ll melt the heart of the person who receives them. A couple of teddy bears is also the symbol of love between two people who want to take care of each other, have fun together and fill those private moments with joy. This basket contains 3 things that send a message that, in its elegance and quality, is both subtle and powerful. 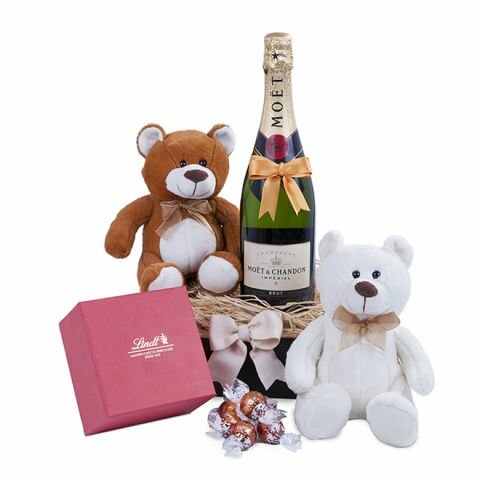 Two sweet huggable bears that will decorate a favourite spot of the home, some superior tasting chocolates courtesy of Lindor and a bottle of unbeatable Moët & Chandon champagne.